Hart is professor of church history and dean at Westminster Theological Seminary. He has written also in the area of Reformed worship (With Reverence and Awe, D.G. Hart & J.R. Muether) and American church history (see last month’s Book Shelf). 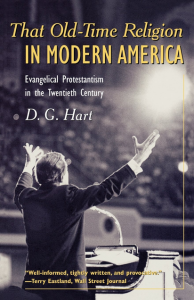 Hart’s purpose in this book (2002) is to examine the influence evangelicalism has had on the 20th century. He lumps fundamental history together with evangelical and calls them both the conservative side of Protestant Christianity. I think Hart gives a realistic view of America’s history as a nation mostly influenced by Protestantism (as opposed to either humanism or Catholicism). Hart is not always complimentary to fundamentalism or dispensationalism but, then, who is these days! He does believe that evangelicalism has had the most influence on America’s history due to its penchant for adapting to the culture and its belief that a Christian’s convictions must be carried with him into all parts of his public life. Hart becomes more critical in discussing evangelicalism’s insistence that America’s government should be based on Christianity rather than a true separation of church and state. To Hart, Christianity operates well in a secular society if it can keep its private gathering biblical and keep its witness sincere and forthright.